On the 18th of August, the inaugural ArtShift art show came alive inside the elegant venue of Alpine Attitude in Menlo Park, Pretoria. Athough the cold came through hard, we managed to weather the storm thanks to the pizzas, wines and good house music. Artshift brought together a melting pot of fine artists, fashion designers and House DJs. 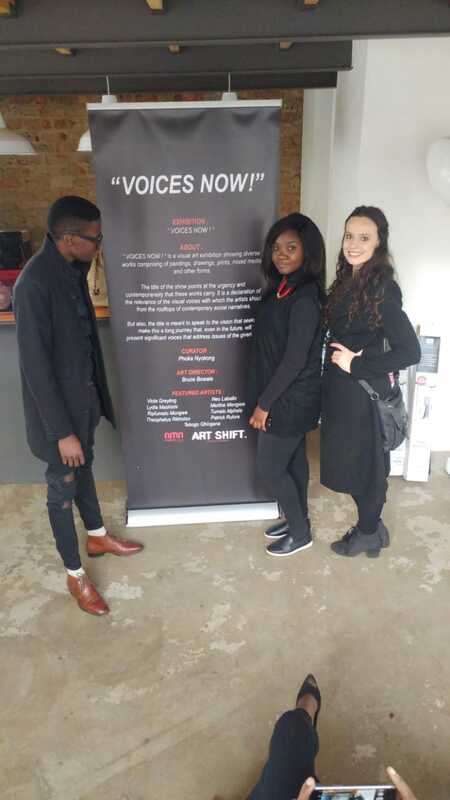 “ArtShift is basically just shifting from one place to another” explained the Art Director, Bruce Bowale, and the curated experience that was setup totally agreed with him. 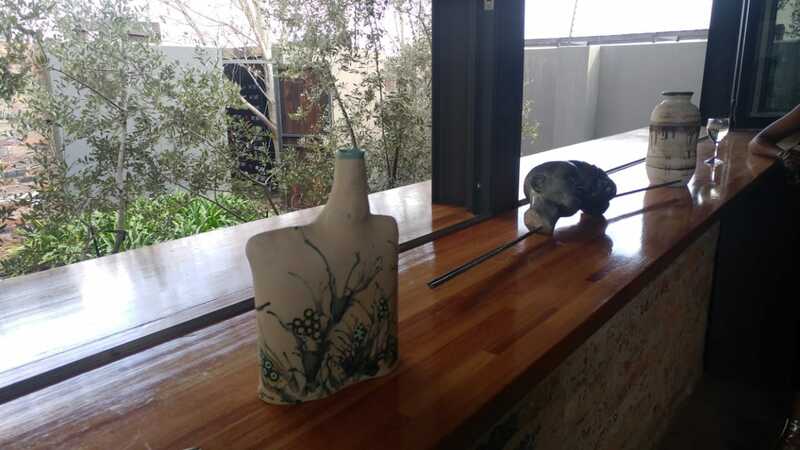 The synergy flowing from the entrance where sculptures and ceramics dominated, to the heart of the space where drinks flowed with smooth house beats and pizza slices, all the way down to the gallery holding up paintings and Hakeem’s fabric creations. That synergy gave one a feeling of understanding what the 20th Century French architect, Le Corbusier, was talking about when he waxed poetic about Promenade Architecture. 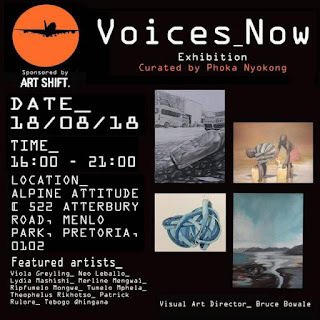 The visual arts was curated by Phoka Nyokong “There’s a declaration of the relevance of the visual voices with which the artists shout from the rooftops of contemporary social narratives” the curator states “But also the title is meant to speak to the vision that seeks to make this a long journey that even in the future will present significant voices that address issues of a given time”. The defaced cement sculpture of Neo Leballo: "I'm trying to tell people that beauty can still exist without our daily masks", she says. 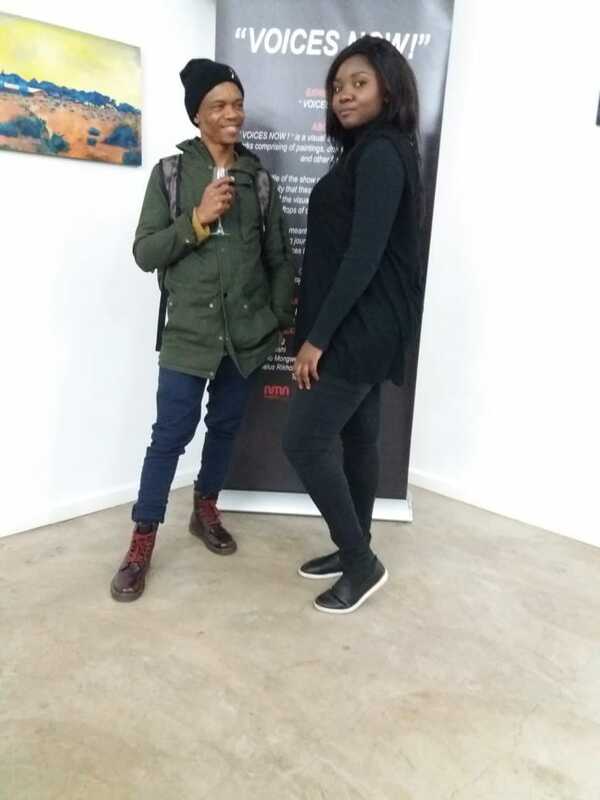 One of the voices that Nyokong chose to present was Ripfumelo Mongwe, a student of Fine Art at the Tshwane University of Technology, who showed three moody acrylic paintings of mountainous valley landscapes. “They suffer from mental illness” says Mongwe about the muses that inspired each piece “My father, my cousin, my grandmother and my uncle”. These paintings are meant to portray how those muses make her feel. Another voice that was shouting from the rooftops was that of Theophelus Rikhotso, who addressed the water crisis with warm blues and browns and an elegant use of perspective that give his images depth. “I grew up in a place where there is water scarcity. So the fact that the struggle still continues thus inspired my creative ideas” said Rikhotso. Viola Greyling showed her ceramics and a painting that recreates her room in a surrealist way. 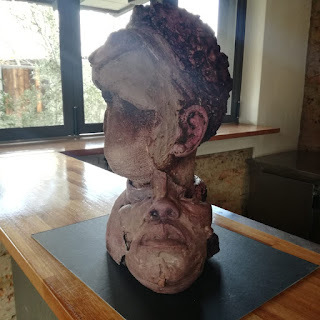 While Neo Leballo showcased a mindblowing defaced sculpture and her charcoal and mixed media portrait, one is a portrait of Morgan Freeman. The ceramics of Viola Greyling: "I use my own photos to put an ornate, or I would use like a lot of symbols like water or clouds". 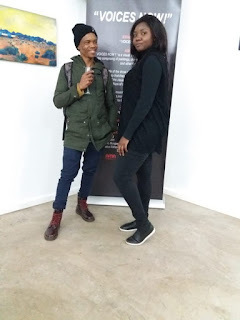 So through the cold, we were heated in the passion of artistry with fine artists, fashion designers and house DJs, shout out to the liquor and pizza, all in all it was a great night out in Pretoria. I can’t wait for next year’s ArtShift.